If you are a victim of a bike crash, the crash was the fault of someone else, and the case is settled with the insurance company why don't you get your settlement check immediately? There are many factors that can play into this, but one big factor is often insurance companies simply wait as long as possible to pay. This raises the question, why would insurance companies employ such a tactic to delay payment on settlements they have already agreed to? The answer is simply that the longer the insurance company keeps the money in their accounts, the more money they can make. By delaying payment the insurance company collects interest and investment gains as the settlement money sits in their accounts rather than the injury victim’s bank account. Thus, insurance companies have every motivation to keep settlement funds in their accounts as long as possible. This scenario changes January 1, 2014 due to a new law signed by Governor Quinn that will ensure timely payments of settlements for personal injury cases. Public Act 098-0548 prohibits insurance companies from delaying settlement payments to bicycle crash victims as well as other personal injury victims. If insurance companies fail to make settlement payments pursuant to the deadlines set in the new law, the injury victim can seek a judgment for compensation in addition to the agreed settlement amount, including costs incurred in obtaining settlement funds and interest on the settlement amount. In other words, if the insurance companies delay after settling a claim for a bike accident, they will end up paying even more. 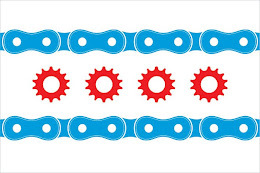 This bill was passed with the assistance of the Illinois Trial Lawyers Association, where Illinois Bicycle Lawyer Mike Keating is a member of the Legislative Committee that worked on pushing this issue. Illinois is long overdue for "prompt pay" laws to combat the motivation of insurance companies to delay settlement payments. This new law will finally give insurance companies a motivation to make settlement payments sooner rather than later. The proposed penalties for untimely settlement payments will help ensure that victims of bicycle crashes will be not only be fully compensated, but also timely compensated. The Illinois Bicycle Lawyers at Keating Law Offices take pride in ensuring that victims of bicycle crashes are fully and timely compensated. If you have any questions regarding this post or an issue involving a bicycle accident, please contact Illinois Bicycle Attorney Mike Keating at 312-208-7702 or MKeating@KeatingLegal.com 24 hours a day, 7 days a week. All e-mails and phone calls are returned promptly. All initial consultations are completely confidential and free. If necessary we can meet with you in our office, in your home, or anywhere else that is convenient to you.